Skipping entire commercial breaks. Setting up our TiVo® to record programs with our favorite actors and directors. Using the app to record when away from home. We all have our favorite TiVo features – now master the rest. Here’s the complete list of features that work with the new TiVo experience on your TiVo BOLT VOXTM, to help you get the most out of your TiVo. 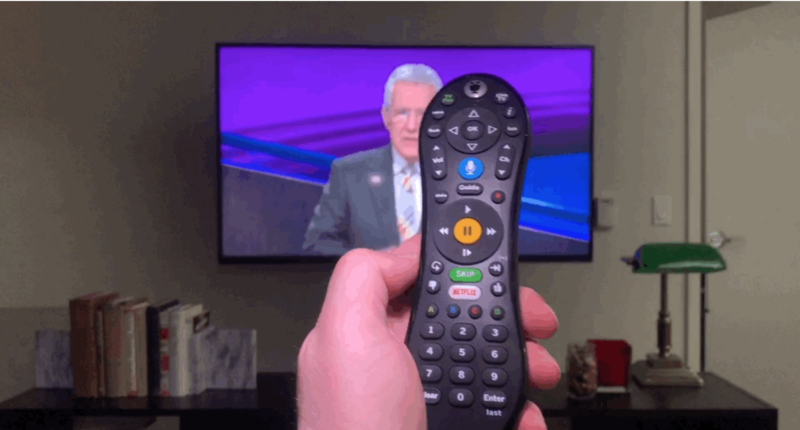 With SkipMode® on your TiVo, you can skip entire commercial breaks at the press of the Skip button (or the D button on some remotes) on popular recorded shows. A short time after a show has aired, you’ll see a Skip icon next to the show title in your My Shows folder when you’re able to skip commercials. 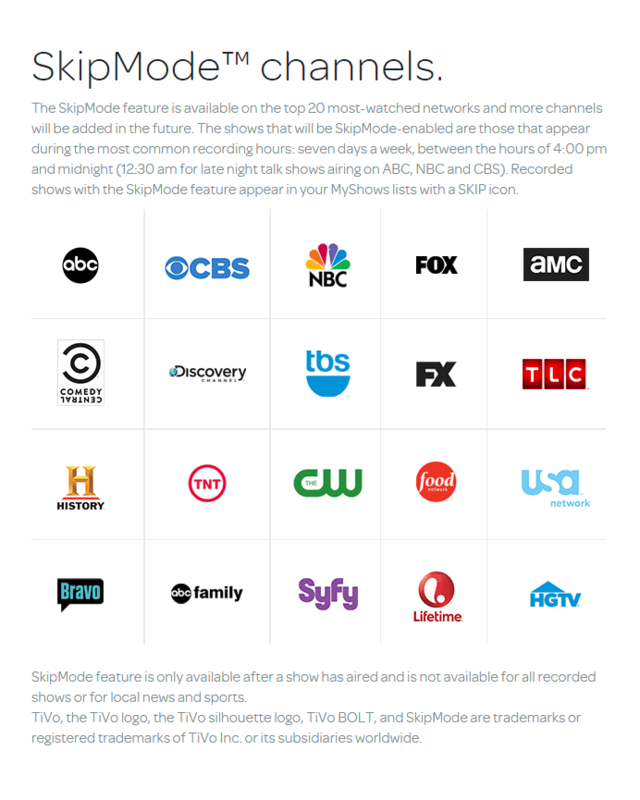 To make it easier to plan, check out our list of shows with SkipMode enabled here: See complete list. TiVo SkipMode lets you skip full commercial breaks at the touch of a button. QuickMode ® lets you watch recorded shows, sports, award shows, and other content 30% faster than normal speed— and the sound stays pitch-perfect. It’s great for getting through the slow parts without missing out on the action. When you’re watching a recorded show, turn QuickMode on or off by pressing “Play,” then “OK” (or “Select” on some remotes). TiVo QuickMode lets you watch content at 1.3X speed. Switching between apps, TV, and web to find content is time consuming, and doesn’t always help you find the best viewing options. TiVo Search enables you to search across TV, apps, and the web in one simple search. TiVo Search lets you find the content you’re looking for across apps, web, and television in one search. The TiVo button at the top of your remote takes you to TiVo Central ®. from here you can access your most used features and recordings, and apps like Netflix, Amazon Prime, Hulu, HBO GO, YouTube, and Pandora. And in some locations, you can also access on-demand content from XFINITY and Cox. TiVo Central is your home base for all of your content. To access the 14-day programming guide, press Guide on the remote or use the TiVo App. From here you can see the air-time for upcoming shows. TiVo Guide shows you what’s happening on all your channels for the next 2 weeks. 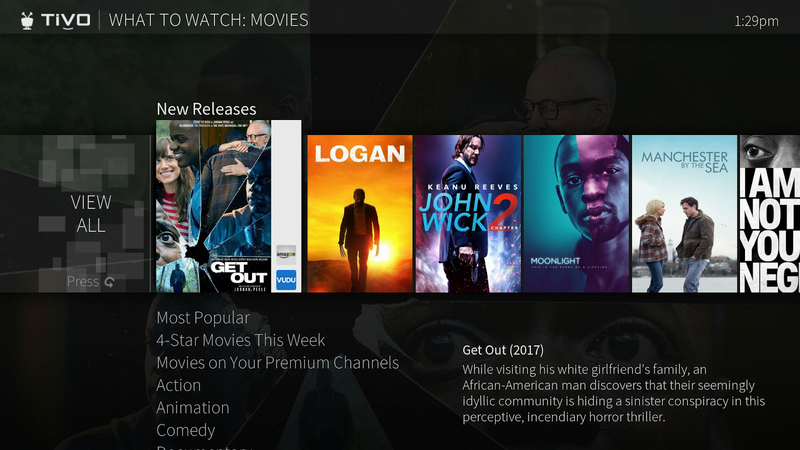 With QuickView TM, you can see what else is on and coming up, over the content you’re currently watching, with just a click of your remote control.  Press Up on your remote to see what’s coming up on live TV. To close, press Back.  Press Down to see the SmartBarTM, which displays the shows you watch regularly. ◀️ Press Left to see your favorite channels. ▶️ Press Right to see what’s playing on other channels. TiVo QuickView lets you see what else is on, without having to stop watching your content. This is where you go to see what’s on TV right now, without clicking through channels or reviewing the Guide. Quickly see which shows, movies or sports are now playing. Unlike the Guide, you’ll see content separated by categories such as popular TV, sports, movies, and kids. TiVo What to Watch Now is your shortcut to see what’s playing on TV. And don’t worry, Suggestions don’t take up your hard drive space. If you want, you can turn off Suggestions in the Settings section within TiVo Central. TiVo Suggestions makes recommendations just for you – across all apps- based on how you watch and rate content. With WishList, you can set your TiVo to record anything featuring a certain actor, director, keyword or category. WishList puts your TiVo to work to find content you are interested in. Pro tip: You can build a complex search using combinations of keywords, actors, and categories to narrow down your results. With TiVo Wishlist, every time a show airs with your favorite actor or director, or about your favorite topics, it’s recorded. You can use your TiVo almost everywhere. Download the TiVo app for mobile devices to schedule a recording through your phone or tablet from anywhere. Here is more on the TiVo App for iOS, and the TiVo App for Android. With the TiVo App, you don’t have to go home to set your TiVo. Record a single show or episode. Just select the show in a search, or press the “Record” (the red dot) button on your TiVo remote when the show is highlighted in the Guide. OnePass gathers every available episode of a series and adds them all to your My Shows list. 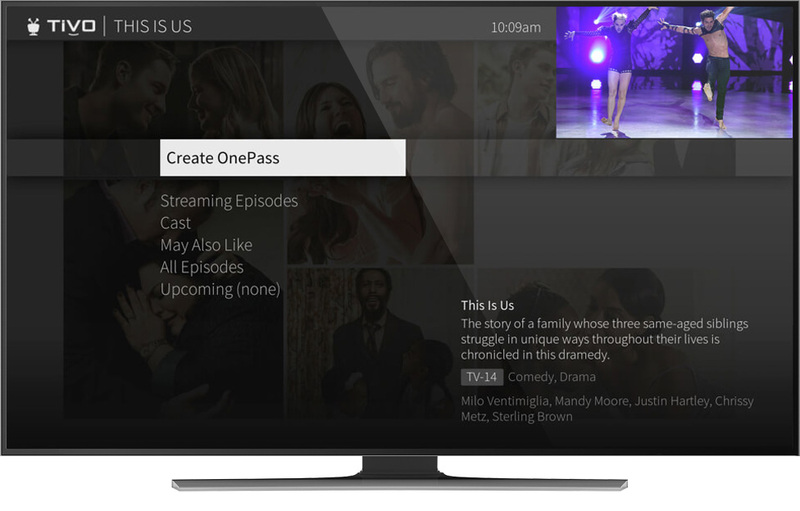 If an episode isn’t available to record, OnePass shows you episodes available to watch instantly from On Demand, Netflix, Amazon Prime, and more. Become a OnePass expert to learn everything you need to know. Set up your OnePass to stream and record your favorite shows by season. With TiVo’s OnePass Quick Select, you can schedule all your OnePass programs with a single click. Quick Select gives you a quick view of the most popular shows on TV and lets you create a OnePass recording for multiple shows on one screen. You can find it on your TV display, or under “Manage” at TiVo Online. TiVo OnePass Quick Select lets you schedule multiple OnePass recordings at a time. Transfer Your Recording Settings – Port scheduled recordings from your old DVR. Go to the “Manage” section at online.tivo.com to transfer your OnePass/Season Passes. 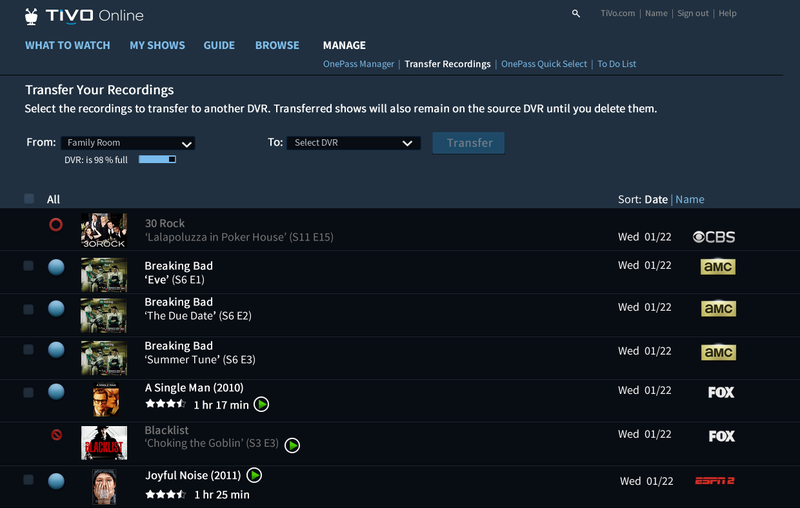 Simply select the OnePass/Season Passes you want to transfer from your old DVR and drag them to the column on your computer screen that lists your new TiVo box. All your OnePass/Season Passes will be available on your new box. This feature is available when transferring among TiVo® Series3/HD, TiVo® Premiere, TiVo Roamio® and TiVo BOLT VOXTM. Keep your recording settings when you get a new TiVo box. Transfer Your Recordings – Keep your shows when you get a new TiVo box. In “Transfer Recording Settings,” we told you how to transfer the settings for shows you are planning to record. But what if you want to transfer the shows you’ve already recorded? Here’s how. Transfer recordings between your TiVo boxes by visiting TiVo Online. Go to online.tivo.com and select “Manage”. Then you can select single recordings, multiple recordings, or all recordings to transfer from one TiVo box to another. If you run out of storage space when transferring recordings between TiVo boxes, the oldest recorded shows on that DVR will be deleted to make room. This feature is available when transferring among TiVo ® Series3/HD, TiVo ® Premiere, TiVo Roamio ® and TiVo BOLT VOXTM. Recordings cannot be transferred to TiVo Series3/HD boxes. Keep your old recordings when you get a new TiVo box. Pro tip: Try activating some of these features with your voice. For example, press the blue VOICE button and say, “Create OnePass” and the name of your show. We hope you found a new feature to try! Want to learn more ways to make your TiVo experience faster, better, and more personalized? Here’s a Button-by-Button Guide to your TiVo VOX RemoteTM. © 2019 TiVo Corporation. All rights reserved. TiVo, the TiVo logo and the TiVo silhouette logo [and any other TiVo trademarks referenced in the piece] are trademarks or registered trademarks of TiVo Corporation or its subsidiaries. All other trademarks are the property of their respective owners. 20 Years Later: Why Do I Need a DVR? Erik Cuevas on VUDU Launches on TiVo! Robert Sermeno on VUDU Launches on TiVo! Jakub Kudlacz on VUDU Launches on TiVo! Richard Garrison on VUDU Launches on TiVo! Jane Carruth on VUDU Launches on TiVo!